The US Food and Drug Administration (FDA) granted 18 new biopharmaceutical product approvals in 2012, covering a broad range of innovation, novelty, and healthcare and market impact. The total includes 16 full/original approvals: biologics license applications (BLAs) and new drug applications (NDAs). The other two products received supplemental approvals, both of them influenza vaccines. Among the 18 approvals were eight recombinant proteins, including two monoclonal antibodies (MAbs) and one engineered antibody-like “trap” molecule. Table 1 lists them all. The overall healthcare impact and projected peak sales of 2012-approved products are both rather limited. Many of these products (perhaps even a majority) are biobetter, me-too, or similar follow-on (more of much the same) products, and many are orphan products — thus inherently limited in terms of their innovation, novelty, and/or markets. The list of approved products does not include any likely blockbusters (defined as having a potential market of US$1 billion/year), and most of them appear unlikely to attain even average biopharmaceutical sales levels (~$250–300 million/year). Overall, besides limited market and healthcare impact, the 2012 FDA biopharmaceutical approvals were numerically inadequate; that is, there is as yet no apparent trend toward increasing numbers of approvals. It is now commonly reported that a growing percentage, now over 40%, of all pharmaceutical industry research and products in development are now biopharmaceutical rather than classical drugs. However, that growth has yet to be reflected in FDA approvals, which remain relatively flat for biologics, with no discernable trend for increasing since the late 1990s. products from large “Big Pharma” companies. None of those records yet exemplify trends. But they do not reflect or bode well for significant biopharmaceutical industry innovation, market expansion, smaller biotechnology company success, or expansion of the US-based biomanufacturing industry. 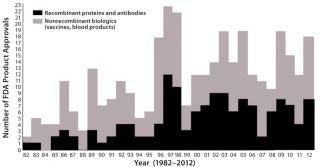 Figure 1 shows the number of new biopharmaceutical products approved each year since 1982 (when the first recombinant protein received approval). It is a rather low and disappointing outcome for the biopharmaceutical industry, particularly, considering that an increasing number of companies (especially the largest ones) are depending on new, innovative biopharmaceuticals for their future survival. Collectively, the products I consider to be new biological entities (NBEs) for 2012 do not reach projected blockbuster levels, and their degrees of innovation and novelty vary greatly. These nine NBEs represent 50% of 2012’s new biopharmaceutical approvals. Compare that with 12 NBEs in 2011, which was 92% of the total approvals. Both the number and percentage of new innovative/novel products were significantly lower in 2012. For the previous year, all but one approval represented a significant advance both for patients and for the healthcare system as a whole — mostly new products for new indications — but that was far from the case with the latest approvals. Close examination of 2012-approved products illuminates thecontinuous spectrum of innovation and novelty exemplified by biopharmaceutical products. Many of the 2012 NBEs are borderline, depending on criteria used. If you scored them on their relative innovativeness and novelty (rather than singling out NBEs), the score for many would be on the low side. For example, the two new four-antigen (quadrivalent) influenza vaccines simply involve addition of a fourth, much the same antigen — whereas Flucelvax (the first cell- rather than egg-cultured) vaccine is fully innovative. The Elelyso product is yet another glucocerebrosidase entering the US market. Even the cancer MAb (Perjeta) can be viewed as a follow-on — another Her2 receptor antibody from the same company behind the Herceptin brand — and it is to be used only in combination with the previous drug. The only products considered to be fully innovative and novel — with nothing similar already on the market — are Gattex (glucagon-like peptide 2), Voraxaze (carboxypeptidase), Jetrea (microplasmin), and ABthrax (anthrax MAb), all recombinant (rDNA) in origin. The other NBEs involve innovative or novel bioprocessing, including formulations. Only three recombinant MAb or antibody-like products (all NBEs) received approval in 2012, down from the record of five in 2011. Only one in 2012 has a cancer indication. We have seen much hype about the large number (hundreds) of MAb products (particularly with cancer indications) in the development pipeline. But very few have yet reached the market. Even the one approved in 2012 (Perjeta, as noted above) may be considered a less-innovative or biobetter version of a similar MAb already on the market. Biosimilars: No biologics received FDA biosimilar approval in 2012, and no biosimilar applications are yet pending with the agency, despite the law passed well over two years ago that authorized biosimilar approvals (1). However, one product that received full BLA approval — Teva’s Neutroval G-CSF — has received biosimilar approval elsewhere; it is marketed as TevaGrastim in the European Union. So some people without a US-centric perspective may consider that product to be a biosimilar. As in the previous three years, the FDA approved no biogeneric-like products — that is, no 505(b)(2) generic drug approvals for biopharmaceuticals — in 2012. The product that by far embodies the the most innovation in bioprocessing is Elelyso (recombinant glucocerebrosidase) from Protalix and Pfizer. The first plant-expressed FDA-approved biopharmaceutical, it is manufactured through suspension cell culture of transformed carrot cells in single-use bioreactors. The product and its manufacturing process were developed by Protalix BioTherapeutics of Israel, with worldwide marketing by Pfizer. None of the 2012 approvals stand out as breakthrough products with broad or significant patient impact. Most are approvals for much the same (or at best partially new) indications. This is much unlike last year, when nearly every approval involved indications for which no effective treatments were previously available or for which no new approvals had been seen in over a decade. (Keep in mind that the much shortened and simplified indications reported in Table 1 are not the full official product indications, which generally include restrictions on eligible patients and product use.) Similarly, 2012 approvals will not significantly increase competition that could result in price decreases. The more significant advances and innovations in terms of indications and patient treatment were Jetrea (microplasmin) from ThromboGenics, the first product for vitreomacular (eye tissue) adhesion; Gattex (GLP-2), the first product of its kind for intravenous feeding/nutrition; Abthrax (anthrax MAb) from HGSI/GSK, the first recombinant antibody-based anthrax prophylactic and therapeutic (but in the absence of biological warfare attacks, itwill rarely be used); Zaltrap (VEGF) trap from Sanofi, a new option for refractory colorectal cancer; and Voraxaze (carboxypeptidase) from BTG International and Protherics, a new option for treating methotrexate toxicity. These findings are derived from the BIOPHARMA: Biopharmaceutical Products in the US and European Markets online database, the only information resource and reference specializing in marketed biopharmaceutical products. Find a running list of FDA biopharmaceutical approvals and related annual analyses online at www.biopharma.com/approvals.html. These annual analyses of FDA biopharmaceutical approvals represent the only series using consistent criteria from year to year for what is (and is not) a new and unique biopharmaceutical and without arbitrarily including small-molecule drugs (1–6). Biopharmaceuticals are determined using an agent/product-centric approach; the type of approval received (e.g., full or supplemental, BLA or NDA) is not the primary determinant for defining new, unique biopharmaceutical products. The term refers to therapeutics manufactured by or using living organisms (based on biotechnology). It excludes those pharmaceuticals manufactured by chemical means, including synthetic drugs and natural products derived from dead tissue (e.g., heparins) (7, 8). Readers should be aware that nearly all other analyses of biopharmaceutical approvals have some problems in terms of coverage. Many include some innovative drugs (e.g., if something comes from a small biotech-type company, then to some people it’s obviously a “biopharmaceutical”), and some now simply use the term for all drugs. The Center for Drug Evaluation and Research’s annual analysis of approvals covers fiscal years and habitually fails to include nonrecombinant biologics approved by the Center for Biologics Evaluation and Research (mostly classic nonrecombinant products). With those FDA and other analyses generally reporting much more positive trends (driven more by classical drug approvals), industry cheerleaders, analysts, and even the trade press tend to report and perpetually recycle their findings while ignoring more rigorous studies that are contrary to their optimism. 1 Rader RA. 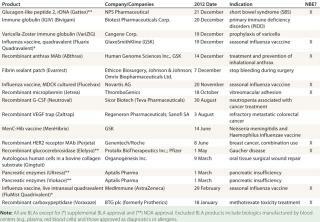 FDA Biopharmaceutical Product Approvals and Trends: 2011. Biotechnology Information Institute: Rockville, MD, January 2012; www.biopharma.com/approvals_2011.html. ville, MD, January 2011; www.biopharma.com/approvals_2010.html. 3 Rader RA. FDA Biopharmaceutical Product Approvals and Trends: Significantly More Approvals Were Granted in 2009. Biotechnology Information Institute: Rockville, MD, January 2010; www.biopharma.com/approvals_2009.html. 4 Rader RA. Low FDA Approvals of New Biopharmaceuticals Continued in 2008. Biotechnology Information Institute: Rockville, MD, January 2009; http://www.biopharma.com/approvals_2008.html. 5 Rader RA. FDA Approvals: Review of 1982–2007 Plus Update for 2008 and Listings from 2006–Present. Biotechnology Information Institute: Rockville, MD, January 2008; http://www.biopharma.com/approvals1.html. 6 Rader RA. Paucity of Biopharma Approvals Raises Alarm: Lower Numbers, Novelty, and Economic Impact Indicate Problems. Gen. Eng. News 28(6) 2008: http://www.biopharma.com/approvals_GEN.html. 7 Rader RA. 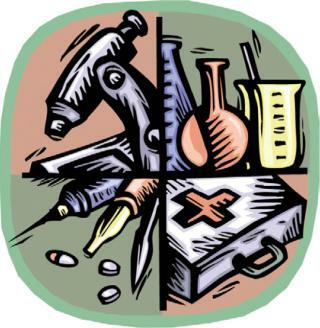 What is a Biopharmaceutical? Part 1: (Bio)Technology-Based Definitions. BioExecutive Int. March 2005: 60–65; www.biopharma.com/BioExec_pt1.pdf. The past year was another relatively poor one for healthcare system and public health impacts, with most biopharmaceutical approvals intended for relatively small niche markets. Even those products embodying the most innovation and novelty are relatively limited in their real-world impact, being mostly for orphan or other indications that affect limited numbers of patients. In the big picture, none of these approved products will save the US healthcare system significant revenue — nor will any of them significantly improve the nation’s overall public health. Overall, the biopharmaceuticals approved in 2012 by the FDA will have little effect on worldwide annual biopharmaceutical revenues, which are now >$165 billion total and over $110 billion just for recombinant antibodies and other proteins. There are no potential blockbusters (>$1 billion/year), which the industry direly needs. In fact, few of these products appear likely to attain even average annual sales, which for US- or EU-marketed biopharmaceuticals run ~$250–300 million/year. ThromboGenics’ Jetrea product has a projected potential peak market of about $400 million. Some (probably overly optimistic) projections foresee a market double that size but apparently assume its adoption for indications not explicitly covered by the initial approval. Because Protalix/Pfizer’s Elelyso glucocerebrosidase is priced lower than its competition, it may capture a significant portion of the current ~$1 billion/year market for such products. And the HGSI/GSK’s anthrax MAb, which was developed primarily for the US biodefense stockpile, could become a multiple $100 million/year product should one or more anthrax biological warfare attacks occur or if terrorists acquire such weapons, requiring governments worldwide to purchase the product for their own stockpiles. No other products appear likely to surpass even a few $100s millions in annual sales. Even collectively, the 2012-approved products appear unlikely to attain eventual total peak sales (based on currently approved indications) comparable to that of just a few blockbuster products. Those are the types of approvals that the industry, patients, and healthcare system need most. Even if these recent approvals eventually add ~$2.5–3.0 billion to biopharmaceutical sales, that is still relatively insignificant, representing only ~1.5–1.8% market growth relative to the current nearly $170-billion worldwide biopharmaceutical market (which will surely be larger, and theimpact smaller, by the time these products attain their peak sales). Worldwide revenues have somewhat consistently grown at ≥15% annually, largely driven by new products and expanded uses for new indications. So this kind of (at best) 2% growth is relatively trivial, if not indicative of serious problems. Only one company (Protalix) received its first US biopharmaceutical product approval in 2012. The other sponsors all had one or more biopharmaceuticals already on the US market. A majority of 2012 approvals — 10 of them (56% of the total), a record number and percentage — involve large “Big Pharma” companies as manufacturer, US marketer, and/or parent company. That includes Teva, the world’s largest generic drug company. In 2011, just one Big Pharma company received a biopharmaceutical approval. Neither of the past two years saw approvals for any of the largest long-established and still-independent biopharmaceutical companies (e.g., Amgen or Biogen Idec). A rapid and major increase in biopharmaceutical approvals is expected in coming years. My company’s database reports more than 45 products with applications currently pending at the FDA or expected to be filed in 2013 (2). That number is slightly lower but falls in line with those reported in previous years. In the next few years, there will also be many filings involving novel classes of products: e.g., gene therapies, cancer vaccines, stem and other cellular therapies, RNA interference, cultured tissue transplants, and personalized biopharmaceuticals. Marketedproducts will become more diverse in terms of their underlying technologies. y currently successful biopharmaceutical as it comes off patent. A recent study of the biosimilars/biobetters pipeline reports over 425 biosimilars and 360 biobetters known to be in development (3). And that study did not include classic biologics — vaccines and blood/plasma products — nearly all of which are (bio)similar to previous versions. The high number of prodocts in the pipeline does not include many of the future major players (e.g., the largest Big Pharma, generic drug, and biopharmaceutical companies), which have yet to disclose their biosimilar pipelines. Much as Merck’s Singulair asthma treatment recently went off patent, with 10 generics approved on the first day it was possible, 10 or more biosimilars/biobetters can be expected to enter the US market as soon as patents and market exclusivities expire for each successful biopharmaceutical. Those include more than 60 current FDA-approved recombinant proteins and MAb products that have revenues >$500 million/year, including 37 at >$1 billion/year. Each of those products could support multiple competing biosimilars and biobetters. For example, capturing just 10% of the current ~$2.5 billion market for insulin lispro (Humalog fast-acting insulin analog) provides a market of $250 million. If just an average of 10 follow-ons received approval for each current blockbuster biopharmaceutical, that would represent more than 350 new-product approvals. So the number of recombinant proteins (>140) that are approved in the United States — and the number of companies involved — are likely to more than double (perhaps triple or more) in the next five years, including many new entrants. More follow-on products (biosimilars and biobetters) will bring more competition and lower prices. But such inherently “me-too” products will also fragment and contract the market rather than expanding the market for each product. The combined market for reference products and their follow-ons will tend to contract as price competition affects an increasing number and percentage of products available. Me-too products do not increase basic treatment options, and they inherently lack significant innovation and novelty. So commercialization of biosimilars (and biobetters and perhaps biogenerics) as current products go off-patent will significantly expand the number of biopharmaceutical products and players. Although this will provide patients and payers with much-welcome price reductions, it will not significantly advance the overall revenue or economic health of the (bio)pharmaceutical industry as a whole — or treatment options available for patients. More Product Approvals Are Needed: Both the number of biopharmaceuticals approved and their economic impact need to significantly increase to ensure continued vitality of the (bio)pharmaceutical industry. It is now commonly reported that well over $80 billion/year is spent on drug R&D, with >40% of that involving biopharmaceuticals. More such products with higher sales are needed to cover the costs of the record amounts of money that have been and are being spent on (bio)pharmaceutical R&D. Many of the largest multinational (Big Pharma) companies now invest nearly half or even most of their R&D in biopharmaceuticals (rather than classical small-molecule drugs), with much of that going for development of MAbs and cancer therapeutics. But despite years of investment and hype, relatively few such products — and particularly, few blockbusters or other products with large projected sales — are yet entering the market. Why Are Approvals Lagging? The reasons for low numbers of biopharmaceutical approvals continue to remain diverse and unclear. It is easy to blame increased scrutiny and higher standards at the FDA, but there are no real data to support that. The agency does not appear to be holding biologics to significantly more difficult-to-attain standards than synthetic drugs. Some people cite the economic difficulties of recent years, which certainly have restricted R&D budgets and reduced the number of products entering late-stage trials. Merging and purging among many of the largest (bio)pharmaceutical companies — with their corresponding addiction to outsourcing — continues to shrink many of those companies’ resources, capabilities, staff, and R&D pipelines. Mergers and acquisitions often rationalized as boosting R&D pipelines rarely seem to do so. Many companies end up in seemingly worse situations than before, particularly in terms of products in their pipelines with significant market potential. This could well explain why some of the largest established companies are moving more into biopharmaceuticals, which with their higher specificity offer a clearer path to approvals. The FDA View: The agency has reported 10 (28%) biopharmaceuticals (by my definition and most conventional use) among the 35 “innovative” product approvals for 2012 (4). But the report presents no useful analyses of biopharmaceutical/biologic approvals, and it should be kept in mind that this covers fiscal (not calendar) year 2012. It is very disheartening to see the FDA follow the lead of the Pharmaceutical Research and Manufacturers of America (PhRMA) and Big Pharma companies (which in recent years have been laying the groundwork for rebranding of themselves and the entire pharmaceutical industry as biopharmaceutical) through promotion of indiscriminate and uncritical swapping of terms. PhRMA cites its members and the entire industry now as “biopharmaceutuical” (not drug or pharmaceutical) companies (5). The organization’s publications vaguely cite some magical, mystical transformation of the industry (never explained how or when) into one that is now thoroughlydominated by biotechnology. But in reality, it is not — in terms of products in the pipeline or marketed, R&D targets or expenses, sales revenue, or any other relevant parameter. The very first sentence in the FDA report’s introduction cites “35 novel medicines developed by the biopharmaceutical industry,” with biopharmaceutical never defined, although the agency has never used the term in such a context before (as far as I am aware). The biosimilars act has redefined biologics to be in line with that of biopharmaceuticals (involving living organisms/biotechnology in their manufacture, as used by most of the industry). So with the line between biopharmaceuticals/biologics and classical drugs now much clearer, the FDA needs to be more careful about adopting improper, never-defined, hype and terminology that are being promoted for public-relations reasons. It is easy to understand why Big Pharma might want to rebrand itself and its industry as biopharmaceutical (sounds better, newer, and more high-tech), but why would the FDA adopt such terminology? An Ill Omen? FDA biopharmaceutical approvals in 2012 were not all that significant in terms of innovation or novelty. Projected biopharmaceutical market and revenue increases attributable to these approvals are insufficient. Similarly, the 2012 approvals provide few significant advances in patient care and few significant positive impacts on the healthcare system. This past year was a record one for less-than-fully novel and innovative products, particularly biobetters and other me-too products. Also, a record number of new products are manufactured outside the United States. Many of the largest (bio)pharmaceutical companies — the major players — along with a large number of smaller biotech companies (essentially the entire pharmaceutical industry) are counting on these products to provide their future profits. If this low number of biopharmaceutical approvals and their mild economic impact both persist, the industry could be headed for big trouble. 1.) Biologics Price Competition and Innovation Act of 2009. 2.) BIOPHARMA: Biopharmaceutical Products in the US and European Markets database, Biotechnology Information Institute, Rockville. 3.) Rader, RA. Biosimilars/Biobetters Pipeline Review. 4.) 2012. FY 2012 Innovative Drug Approvals: Bringing Life-saving Drugs to Patients Quickly and Efficiently, US Food and Drug Admininstration, Rockville. 5.) Rader, RA 2008. (Re)defining Biopharmaceutical. Nature Biotechnol www.biopharma.com/biopharmacopeia/Redefining.pdf 26:743-751. 6.) Rader, RA. 2007. What Is a Generic Biopharmaceutical? Biogeneric? Follow-On Protein? Biosimilar? Follow-On Biologic? (Part 1). BioProcess Int 5:28-38. 7.) Rader, RA. 2007. What Is a Generic Biopharmaceutical? Biogeneric? Follow-On Protein? Biosimilar? Follow-On Biologic? (Part 2). BioProcess Int 5:20-28.